Pinnacle Sports if a sports betting site known to attract serious punters, but you don’t have to be a high stakes bettor to appreciate what Pinnacle Sports has to offer. Instead of bonus offers and other frilly marketing campaigns, Pinnacle Sports offers great odds and a winner-friendly policy. This is not a sports betting site that will try to discourage you from betting just because you are making a long-term profit. Pinnacle Sports was founded in 1998. The site is owned by Pinnacle Sports Worldwide and operates with a gambling license from Curaçao. Pinnacle Sports is a huge sports betting site with odds for a myriad of sporting events. In addition to “physical sports” such as football, basket, baseball and ice hockey, you can also bet on stuff such as chess and poker here. Many sports that are absent from other sports betting sites are represented on Pinnacle Sports, including roller skates hockey and water polo. Pinnacle Sports focuses chiefly on sports, you can also find odds for a few other things here, such as the Westminister Dog Show, Miss Universe, the U.S. presidential election, American Idol, the Emmy Awards, the Academy Wards, the Eurovision Song Contest, and the Grammy Awards. Pinnacle Sports is popular among the hard-core punters for several reasons, and one of them is that Pinnacle Sports tend to raise the upper betting limit the closer in time we come to the start of an event. Pinnacle Sports has a web page available that is specially adapted for mobile touch screens. Go to www.pinnaclesports.com/m to access Pinnacle from a smartphone or tablet. Since you access the site in the browser window, no app is needed. For more basic mobile devices, a WAP service is still available. 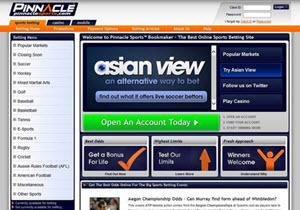 Pinnacle Sports chief focus is pre-event betting, but they do offer some live betting as well. They are not the best site to go to if you want a large and deep live betting offer. At Pinnacle Sports, live betting is typically only offered for the pretty big events; the ones that are destined to draw quite a bit of media attention. Examples of leagues that are large enough to be represented in the Pinnacle live betting offer are NBA , NHL, MLB, NCAA and NFL, as well as the football leagues La Liga, Serie A, English Premier League, Champions League, and Bundesliga. Pinnacle Sports only offers support through email. You can’t call the support, there is no call-back service and there is no live chat support. This means that you can never get help in real-time from the Pinnacle Sports support. The email address is csd@pinnaclesports.com. Pinnacle has an online casino with games from Galewind. The Pinnacle Casino is filled with slot machines, video poker machines, table games, instant keno games, and more. High stakes gambling is available, but you don’t have to be a high stakes gambler to play in this casino. There are no welcome offers, no time limited campaigns and no perks for active players, with one notable exception: Pinnacle Casino will give you a 0.3 percent cash back on all casino wagers. A mobile-adapted version of the casino is available. You access it directly in your browser, so there is no need for an app.